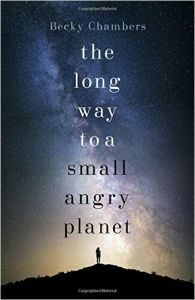 Let me say straight off I enjoyed ‘The Long Way To A Small, Angry Planet’ this book by Becky Chambers, an author I had never heard of before. The difficult bit for me was trying to work out why I enjoyed it. We have the story of the crew of the Wayfarer as it goes about its business of creating new wormholes between distant locations. At the beginning, the crew is comprised of Lovelace the ship’s AI, four humans and three aliens. The humans are Captain Ashby Santoso, the algaeist Artis Corbin and the two comp techs’, Kizzy and Jenks. Comp techs seem to be fluent in computers and general ship maintenance. If something goes wrong, send for the comp tech. We have a mixed bag of aliens on board starting with the feisty Aandrisk Sissix, who’s the ship’s pilot. I had a mental picture of her as an upright lizard. Graceful but reptilian with teeth and claws. Next up is Dr. Chef, a male Grum who is about twice the size of a human and has six limbs. These can act as legs with feet or arms with hands. Dr. Chef (not his real name, that is unpronounceable to humans) acts as the ship’s Chef and Doctor, hence the name Dr Chef. The last alien is the enigmatic navigator Ohan, who’s a Sianat Pair (it’s complicated). In an attempt to move up a notch and land higher paying contracts, Captain Ashby recruits an office clerk. Step forward another human, Rosemary Harper, who joins the ship as it prepares to start tunneling another wormhole. Now I appreciate that this hardly sounds like the action-packed adventure, but believe me there is something about this story that makes it hard to put down. Yes, things do happen and they visit strange places but this story is really about the crew. Each of the characters are interesting in their own peculiar way. Nothing is off limits here with inter-species relationships forming. Sometimes this is against the prevailing taboos of the species involved. There’s also the rather odd relationship of Jenks (human) and Lovelace (ship AI). With the addition of a company clerk to keep the paperwork up to date and organised, Ashby manages to hit the big time when he lands a contract usually many levels above his average earnings. Unfortunately, this contract entails a long travel time to get to the starting point which means they have to make several stops for supplies and crew breaks. Getting attacked while they are on route adds to the excitement but even this is largely a vehicle to explore the crew’s relationship with each other. I hope I am not doing it a disservice here as I found it all very enthralling. It’s the type of story I could easily envisage as a TV show. Perhaps the two hour special to introduce a new series. The authors strong point is creating human characters which you can relate to and alien characters that are both interesting and novel. Where the story might be considered lacking when compared to other space operas, is that there isn’t any overarching background conspiracy or mystery. It’s simply the tale of a ship employed to fulfil a contract which doesn’t quite go to plan. The crew develop and cope, sometimes badly, with events beyond their control. I think it’s the quality of the writing which hooks you in and won’t let go. Each character has a history or particular quirk that makes for compulsive reading to find out what they do next. The story has a good ending and there’s more than enough material left over for several more episodes. Each crew member has their own story and you will finish the novel wondering what happens to each of them on the Wayfarer’s next contract. It would be prudent to keep an eye out for any other of Becky Chambers work especially if its related to the Wayfarer crew as I think it’s got the potential to break into the big time.